Are you avin a laff? there is in fact nothing that can be observed in the climate system that would be inconsistent with climate model predictions. If global cooling over the next few decades is consistent with model predictions, then so too is pretty much anything and everything under the sun. I explicitly wrote "over the 30 year time frame there will be strong warming" - and actually 20y would be a safe bet too. I see that you have once again avoided addressing this question. Warming over 30 years is assured, 20 years must be "very likely", 10 years I would certainly say "likely" but that is a bit of a rough estimate. I could do a detailed calculation about the probability of different trends over the next 30 years, but that's already been done. James, when you write, "Warming over 30 years is assured, 20 years must be "very likely", 10 years I would certainly say "likely" but that is a bit of a rough estimate" you are much closer to what I am looking for. I am asking for somewhat less "roughness" in these estimates, and grounding them more quantitatively than this sort of hand-waving which is a common response. you asked for more quantitative estimates, but did you read the link I provided, where such quantitative estimates were explicitly presented 6 years ago? If, after reading that (and the two papers it refers to) you still have a question then feel free to follow up. If you think that I'm focused on 2020-2030 (the subject of the essay in Nature that you linked to) then you are not really paying attention. Roger, you started off with "if global cooling over the next few decades..." (my emphasis) which remains on your blog even after several people have pointed out that it is a gross mischaracterisation of the Keenlyside paper. So I pointed you to explicit probabilistic predictions about the next few decades which are as clear as day about the probability of cooling over that time frame. If you want shorter term, I'm sure you have already seen the Smith et al Science paper, within which 50% of years post 2009 are predicted to beat the 1998 record. But as you can see, this is still a rather young area of science, and Keenlyside disagree to some extent (although not as strongly as some have portrayed it - I think their 10y mean forecast could still validate even if we see some new records). (these being direct quotes from the paper I linked to earlier). As I mentioned back then, I think these forecasts do have some limitations, but since I pointed them out to Roger 10 days ago it is more than a little tendentious of him to repeatedly insist that they do not exist, and furthermore to pretend that he's been met with nothing but dodging and evasion in response to his question about which observations over the next few decades would be inconsistent (at the 5% level) with the model forecasts. The reason why that paper specifically looked at decadal averages over a 30 year interval is because on this time frame the GW signal is clearly visible above natural variability, but its magnitude is not very sensitive to emissions scenarios (within reason). But it is a simple matter of reading off the graphs for anyone who wants a different forecast interval. However, it seems quite clear that Roger is more interested in pretending that the answer has not been provided, than in actually looking at it. He's avin a laff. Also relevant: Eli Rabett and RC. This is a local hospital for local people - there's nothing for you here. This is an ugly story which I heard on the grapevine, and which is unlikely to feature in the Japanese press (unlikely to be made into a bizarre comedy either). Recently someone here in Japan needed some medical treatment, so they found an official web-site listing local hospitals with English-speaking staff, and when they tried to go there, they were refused on the grounds of nationality - the head doctor had simply decided they were going to stop taking any foreigners! It was not an urgent case, and they found treatment elsewhere, but it's still a rather shocking reminder of how this sort of bigotry is casually accepted at all levels in society here. They may be desperate for foreign tourists to come and spend their money here, and for "guest workers" to come to prop up their economy (so long as they don't get big ideas about settling here, and go home after a few years), but a large proportion don't actually think foreigners are human, and a "foreigners not welcome" attitude, although thankfully rare (except when renting accommodation, where it is the rule rather than the exception) is still considered quite acceptable. Kerosene-soaked man catches fire after trying to smoke at Nagoya police station. So our comment, Nicola Scafetta's comment, Reto Knutti's comment, and Steve Schwartz' reply (combined to all of us) are all on line and some people seem to be getting very excited by it all. In his reply, Schwartz was quick to jump at Scafetta's suggestion that the "pertinent time constant" can actually be diagnosed as about 8y, or maybe 12y, and seems happy to admit that his original analysis (5y) was wrong. Unfortunately, the reviewer(s?) and Editor gave him free rein to present a completely new analysis, based on a new model - hardly the point of a Reply, I thought - which is pretty much just as bogus as the original although the numbers don't turn out quite as absurd. The basic point, that we made in our comment, is that it is trivial to check that such proposed "novel" analyses actually diagnose something useful for systems where the answer is known in advance (and furthermore, whether such extreme simplifications have some chance of capturing any useful information about complex systems), and such testing should normally be something that a researcher should have a go at themselves, before claiming to have overthrown a few decades of climate science. It will be no surprise to anyone who actually works in the area that the new analysis fails just as dismally as the last one, and for much the same reasons. I can't be bothered with a detailed analysis so will just highlight what appears to be the most immediately fatal flaw in the whole idea. The analysis rests on the claim that the climate system can in fact be characterised by two well-separated time constants, and further that these can be diagnosed from the time series of global mean surface temperature. The foundation for this second claim seems to based on a test case where Scafetta attempts to fit his curve to the output of a synthetic time series with known properties. He used a time scale of 12y for the test, and gets an estimate of about 8y out (which matches his analysis of the real climate data), and thus claims that the real answer is either 8 ± 2, or 12 ± 3 - and apparently sees no irony in the fact that these two answers don't even overlap. There is no indication of what these ± values are supposed to indicate, and it is apparent to the naked eye that his lines (in all of his figures) are not actually best fits to the data. Despite this evidence of bias, he finally presents the the lower value of 8 as the "observed value" in his conclusions, only mentioning 12 as a "hypothetical" possibility even though his own analysis, limited as it is, indicates that higher value as a best estimate (after correcting for his estimate of the bias) and admits some additional uncertainty above that value. So his test is kind of like what we did in our comment, except we did it properly, using a wide range of time scales (5-30y) in the synthetic time series and looking not only at the mean bias but also the uncertainty of a single replicate, in order to get a good handle on how the analysis performs. Of course, we found that both the bias and the uncertainty grow for the larger time scales, which follows directly from known properties of the (Bartlett's rule) method. In fact at the highest-valued time scale of 30y (corresponding to a sensitivity of 6C in this simple model) the analysis generates an estimate that is typically less than half the true value and quite possibly as low as 5y. The obvious conclusion is that you can't reliably diagnose the time constant of an AR(1) time series by this method unless the length of data set available is much much longer (by a surprising margin) than the characteristic time scale of the system. Adding in another two free parameters, as Scafetta does, can hardly improve matters, and neither does using the monthly data (even though Schwartz says this adds "many more independent data points", it clearly does nothing of the sort given a decorrelation time scale of several years). Lucia in the posts linked above has taken it upon herself to check the accuracy of the method. Her latest post indicates at least that she is starting to look on the right lines, although she's not quite got there yet and her belief that the uncertainty "should drop dramatically" when she uses monthly data is mildly amusing. Eventually, if and when she checks the method against synthetic data with a really long time constant, she will probably realise that the output of the analysis is so inaccurate that it doesn't tell us much at all. And remember that this is in the best possible case where the data actually are generated by a system which exactly satisfies the hypothesis of a simple autoregressive system with white noise forcing. Once you consider that the real world is rather more complicated (both in terms of multiple time scales of response, and the strong but non-linear external forcing) it is a bit of a lost cause. So, if Lucia does her homework properly, she ought to get there in the end. Whether or not she will have the manners to retract her stupid statement that "two of the criticisms are flat out wrong" (in our comment) remains to be seen. Steve Schwartz also looked up a method (from Quenouille, 1949) that reduces the bias of Bartlett's Rule in estimating the autocorrelation coefficients. What he failed to observe in his reply is that although the mean bias is indeed reduced by this approach, the uncertainty gets larger, which (depending on the specifics) roughly compensates. That is, one can still get estimated time constants that are much smaller than the true value, but the modified method can also generate estimates that are much larger, with the estimated correlation often exceeding 1. But instead of any meaningful analysis about how this impacts his results, Schwartz prefers instead to waffle on about Einstein and electrical circuits, presenting yet another simple model (different from Scafetta's) without making any attempt to explore how well it can either be identified from the data (it can't) or matches any plausible model of the climate system (it doesn't). I would have hoped that any competent scientist could have worked that out for themselves prior to even bothering to submit this sort of stuff for publication, but climate science work in mysterious ways sometimes. It is curious how sceptics are quick to dismiss numerical models that actually represent the broad details of the atmospheric and oceanic circulations reasonably well, in favour of some simple approximations that make no attempt to do so. The issue here of course is not whether the models are "correct", but whether a method that makes no detailed assumptions about the behaviour of the climate system (only really requiring that it conserves energy) can actually diagnose the behaviour of any system, simple or complex. Schwartz' and Scafetta's various methods fail dismally on all counts. I have been waiting for the RC take on that Keenlyside et al paper. To be honest I had been wondering if they were going to duck the debate, having quickly decided that they couldn't find anything good to say about it. So I'm pleased to see that in fact they were doing some behind-the-scenes checking with the authors (to make sure that the media coverage was accurate) and have now issued a bold challenge offering to bet against the prediction of "slight cooling relative to 1994-2004 conditions". No-one who has read my comments will be surprised to hear that I strongly favour the RC side. Indeed I just recently made another bet that is rather more confident of a more significant warming by 2011 (which I don't consider to be a sure thing, but do consider to be in my favour). I see that even William Connolley has been tempted to come back from retirement to get a piece of the action! Keenlyside and his colleagues can hardly refuse the offer given their confirmation of the reported statements (at least it wold be a humiliating climb-down for them to do so). I hope they will learn a useful lesson - and that other scientists who are tempted to make extravagant claims (in order to get their papers into Nature?) may also think twice about the risk of having their bluff called so publicly. It's one thing making essentially unfalsifiable claims about 100 years of change (since we won't be around to see the results) but quite another to say something meaningful about the next few years! All I do is place a modest bet for some warm temperatures and a socking great big volcano goes and erupts. Well at least I didn't put much money on it. Actually, it's not all doom and gloom. There are several factors that weigh against it really making too much difference to my probability of winning. First, it is not really that big yet, although it may get worse before it gets better. Second, it is at a fairly high latitude (42S) so the plume may not spread over the tropics where it would have most effect. Third, it is going to be winter down there for the next few months so there isn't much sun to reflect anyway. Fourth, these things usually don't have much effect past the first year, and I'd already basically written off 2008 due to the coolish start it's had. By 2009, let alone 2011, it may well be ancient history. Probably someone is already running some predictions of the effect it is likely to have. I'd try it myself it I had the necessary tools. Of course it's having plenty of effects right now for the people who actually live there. There are some impressive pictures here and here. I freely admit that I was confused about Bayesian and frequentist probability a few years ago. In fact I wince whenever I re-read a particular statement I made in a paper published as recently as 2005 - no, I'm not telling you where it is. In my defence, a lot of stuff I had read concerning probability in climate science (and beyond) is at best misleading and sometimes badly wrong - and hey, the referees didn't pick up on it either! But really, given some time to think and some clear descriptions (of which there are plenty on the web) it is really not that difficult to get a handle on it. A confidence interval is a frequentist concept, based on repeated sampling from a distribution. Perhaps it is best illustrated with a simple example. Say X is a unknown but fixed parameter (eg the speed of light, or amount of money in my wallet), and we can sample xi = X+ei where ei is a random draw from the distribution N(0,1) - that is, xi is an observation of X with that given uncertainty. Then there is a 25% probability that ei will lie in the interval [-0.32,0.32] and therefore 25% of the intervals [xi-0.32,xi+0.32] will contain the unknown X. Or to put it another way, P(xi-0.32 lt X lt xi+0.32)=25% (and incidentally, I hate that Blogger can't even cope with a less than sign without swallowing text). Note that nothing in the above depends on anything at all about the value of X. The statements are true whatever value X takes, and are just as true if we actually know X as if we don't. The confusion comes in once we have a specific observation xi = 25.55 (say) and construct the appropriate 25% CI [25.23,25.87]. Does it follow that [25.23,25.87] contains X with probability 25%? Well, apparently some people on Wikipedia who call themselves professional statisticians (including a university lecturer) think it does. And there are some apparently authoritative references (listed on that page) which are sufficiently vague and/or poorly worded that such an idea is perhaps excusable at first. But what is the repeated sample here for which the 25% statistic applies? We originally considered repeatedly drawing the xi from their sampling distribution and creating the appropriate CIs. 25% of these CIs will contain X, but they will have different endpoints. If we only keep the xi which happen to take the value 25.55, then all the resulting CIs will be the same [25.23,25.87], but (obviously) either all of them will contain X, or none of them will! So neither of these approaches can help to define P(25.32 lt X lt 25.87) in a nontrivial frequentist sense. (which is Bayes Theorem of course) and you can see that on the right hand side we have P(X), which is a prior distribution for X. [As for the other terms; the likelihood P(xi=25.55|X) is trivial to calculate, as we have already said that xi is an observation of X with Gaussian uncertainty, and the demonimator P(xi=25.55) is a normalisation constant that makes the probabilities integrate to 1.] So not only do we need to consider X probabilistically, but its prior distribution will affect the posterior P(X|xi=25.55). Therefore, before one has started to consider that, it is clearly untenable to simply assert that P(25.32 lt X lt 25.87) = 25%. If I told you that X was an integer uniformly chosen from [0,100], you would immediately assign zero probability to it being in that short confidence interval! (That's not a wholly nonsensical example - eg I could place a bag-full of precise 1g masses on a mass balance that has error given by the standard normal distribution, and ask you how many were in the bag.) And probably you would think it was mostly likely to be 25 or 26, and less likely to be more distant values. But maybe I thought of an integer, and squared it...in which case the answer is almost certainly 25. Maybe I thought of an integer and cubed it... In all these cases, I'm describing an experiment where the prior has a direct intuitive frequentist interpretation (we can repeat the experiment with different X sampled from its prior). That's not so clear (to put it mildly) when X is a physical parameter like the speed of light, or climate sensitivity. But anyway, the important point is, the answer necessarily depends on the prior. And once you've observed the data and calculated the end-points of your confidence interval, your selected confidence level no longer automatically gives you the probability that your particular interval contains the parameter in question. That predicate P(xi-0.32 lt X lt xi+0.32) is fundamentally different from P(25.23 lt X lt 25.87) - the former has a straightforward frequency interpretation irrespective of anything we know about X, but the latter requires a Bayesian approach to probability, and a prior for X (and will vary depending on what prior is used). Corbyn thinks that May should be about average for rain (90-115% of normal) but rather chilly, at 0.5 - 1C below average for the month. There aren't any exciting weather events forecast (you can't go far wrong with "variable: some showers" in May). 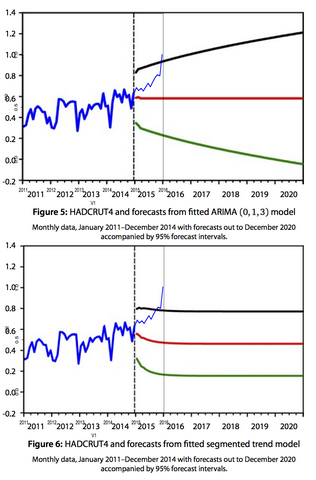 "What observations would be inconsistent with climate model predictions?" Roger Pielke keeps on posting the same question, and keeps on ignoring the replies, so rather than just posting it again in his comments I'll write it out in full here. First, I should make it clear that I don't accept the true/false dichotomy implicit in his question. Is the Newtonian view of gravity "falsified" by relativity? I suppose so, but in practical terms for everyday applications, it does just fine. Is relativity "falsified" by the Pioneer anomaly? Maybe, at some level. I wouldn't like to bet on that one. No-one is going to "falsify" the fact that CO2 absorbs LW radiation - that doesn't make this statement an act of "faith", it simply makes it true. That said, some observations would strongly modify our views on the impact of this on the Earth's climate. Most obviously, sustained cooling on the multidecadal time scale would greatly change our estimates. (I'm ignoring the theoretical possibility of major external shocks such as meteors, volcanoes, or nuclear winter). Warming over 30 years is assured, 20 years must be "very likely", 10 years I would certainly say "likely" but that is a bit of a rough estimate. Note that despite the press coverage of the Keenlyside et al work, they don't actually predict any cooling in the future (although they do seem to think it cooled from 1990 to 1998)! Of course there are also upper limits to the expected warming trend (of roughly double the central model projections, at the same level of confidence as I've given the warming/cooling threshold). But I've seen presentations which explicitly draw attention to the possibility of ~5y cooling trends even with a strong background warming, so obviously on the very short time scale we can't expect global mean temperatures to tell us anything conclusive or even highly informative. After all, global temperatures decreased by a whopping 0.22C/year only 10 years ago (1998 to 1999) - that's a rate of 22C per century!! Scary ice age is going to kill us all!!! Not. I'm sure Roger will find some way of not reading or understanding this. After all, I wrote it in the first comment to his post, and then posted it again in direct answer to his question, and he still ignored it (and according to a comment, Gavin said the same thing previously). I could do a detailed calculation about the probability of different trends over the next 30 years, but that's already been done. FWIW, I think there are some problems with the work described in that article, and intend to have a go myself shortly, but I don't expect to see any really large changes - the issues are similar to those in the climate sensitivity stuff I've talked about before, but I expect the impacts to be smaller in the transient case. It's been finally accepted, after a rather Byzantine review process, but not such a long delay as seemed possible at one time. There were no real substantive changes to the original version, but we took out the reference to monthly data as Schwartz hadn't actually made any claims about it. The pdf is now up on my home page. I've no idea how long it will take to appear in print. ...is appearing in Nature tomorrow, accompanied by some rather odd press (and blog) coverage. The paper itself also seems a little odd to me (but not as odd as the coverage). The authors have nudged sea surface temperatures to observations, which is probably the simplest plausible first step in coupled model initialisation (and I think has been used in seasonal prediction for some time). Mostly, they are looking at regional results (and predictions), especially the North Atlantic, but they also include some global analysis. For this, they are predicting very little change in mean temperature for the next few years, after which the trend will revert strongly upwards. Roger Pielke somehow saw "the world may cool over the next 20 years" which seems comprehensively contradicted by what the paper actually shows in their Fig 4. I've posted a comment on his blog. Curiously, the global temperature prediction is contained in a graph which also appears to show (confirmed in the supplementary info) that the free-running model integrations actually tracked historical temperatures better than the nudged ones. This does not look like a good sign to me! In fact they only seem to show that their system has some skill in representing the phase of natural oscillations in some areas, and (unless I've missed something) never actually claim that it has any skill at predicting mean global temperatures (hence their use of correlations rather than the more usual RMS errors). 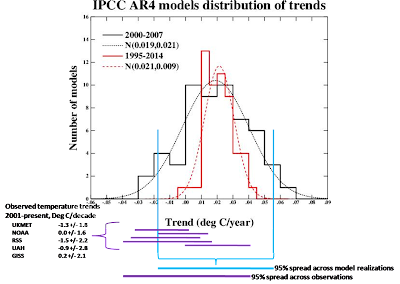 They also have a rather odd graph of the IPCC results, which seems to imply that these models predicted a ~0.3C mean rise over the current decade (and the lead author quotes that value in the Telegraph article). I have not read the paper carefully enough to work out how they managed that, since as I just showed yesterday, the IPCC models on average generate a very linear response (and it's just under 0.2C/decade currently). It may be something to do with how they splice the 20th century simulation on to the A1B scenario projection - eg there could be an abrupt change in forcings, since the scenarios originally started in 1990. But anyway, that doesn't seem like a very fair comparison. I suppose I should interpret this paper as implying that I'm less likely to win my bet than I thought yesterday. It would be biased of me to cling to Smith et al. as support and simply choose to ignore this less convenient one. But I honestly think Smith et al did a better job at demonstrating the value of their method, especially for predicting global temperatures over the 5 year time scale which is most directly relevant to me. It does seem that there is (almost certainly) a strong contradiction between the results, so one of them has to be wrong!